Kagisho police near Kimberley have appealed to the public to assist in identifying the women following the alleged incident last month. Police spokesperson Lieutenant Olebogeng Tawana said that on 25 September, women thought to be “aged between 20 and 30, dark in complexion, 1.6 and 1.7 metre tall, were allegedly driving in a silver hatched back VW Polo with Limpopo registration number plates, in the area of Retswelele in Galeshewe”. Tawana said: “The women introduced themselves as Barbara, Rolufu and Daphney. It is alleged that they stopped near a house in Retswelele, asking for a direction to the Kimberley city centre. “A 32-year-old man willingly directed them in the direction to drive to the Kimberley city centre. However, they deceptively asked the man to accompany them until into the city centre, as they will give him a taxi fare back to his house in Retswelele where they had picked him up. While they were driving towards the city centre, they offered the man a glass of wine, which he is suspicious that the women might have spiked it. He subsequently passed out after drinking it. 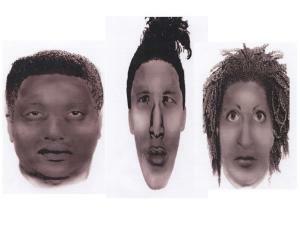 Tawana called on anyone with information about the women on the identikit, to contact the investigating officer Sergeant Daniel Satisfied at 053 8076 161 or 083 9400 503.